This is Andrea's latest contribution to the speech recognition world and is a top class in every way. It is small, works beautifully, and relatively inexpensive. It is about the size of thumb drive and has input jacks for both the microphone and speaker plug from your headset microphone. Unique to this device is employment of Pure Audio noise reduction algorithms. The result is extraordinarily low noise ceilings and excellent results with speech recognition products. Although Andrea previously included a mini CD with an audio software package including Audio Commander, Audio Wizard, and Voice Center, they now provide access to this software using via web download. Please see the link below for details on these products - none are needed in order to use this device with speech recognition software. Special Note: A few users have had troubles with the drivers that come with this device and Andrea has posted updated drivers for the Pure Audio series of products at this location: Software Update for USB Audio Products. Scroll to the bottom of the page. Comments: This seems to be a remarkably good product and works extremely well with speech recognition software. It clearly has lower noise ceilings than other USB sound adapters (see sample Dragon NaturallySpeaking speech/noise ratio obtained with an Andrea 91 microphone below). From Vanida Sakudomchai of Pathumthani, Thailand on 2/15/2016 . Can we use DHL. replace USPS. ? DHL transit time 3days., USPS transit time 5days. 10/22/2016 – My computer recognizes this, but your device his is not recognizing my microphone. Thought I needed to download a driver . . . Response From Speech Recognition Solutions: The Andrea Pure Audio sound adapters are plug-and-play devices, and so typically do not require the installation of drivers. There are a number of web sites that offer the latest drivers for these products, but I'm not certain that this will fix your problem. 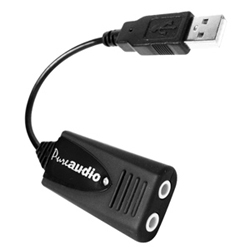 Have you tried using the microphone plugged directly into your sound card rather than via USB using the adapter? If so, did that work at all? If not, then the problem may be in the microphone rather than the Andrea adapter.